This is a guest post by Dhaval Panchal an experienced executive, Agile Coach, and Organization Design consultant. He is also the founder of Evolve Agility, a Texas based coaching and training consultancy, read more about him here. 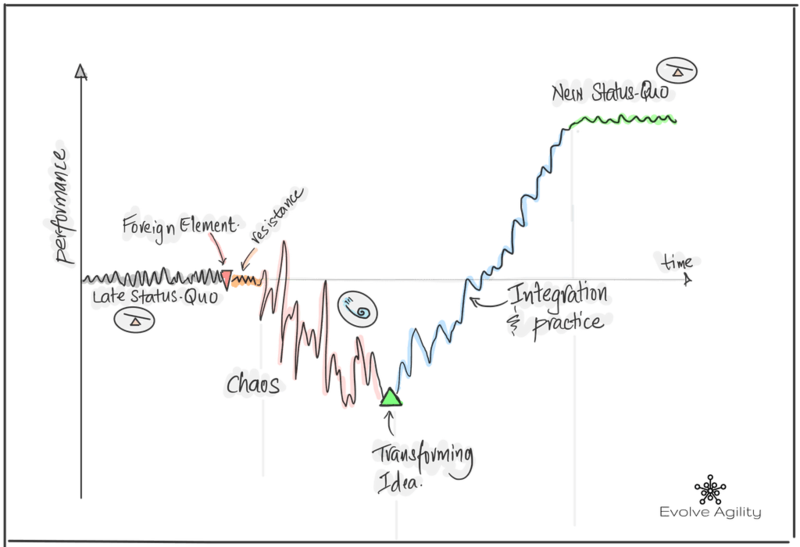 The Satir Change model applies to individuals as well as systems of individuals. It is one of the cornerstones of the family therapist Virginia Satir’s work on how change takes place. A fairly stable system (individual or groups) with predictable familiarity and comfort. Actors in late status quo system may not be comfortable with “the way things are” but they have familiar solutions to common problems. 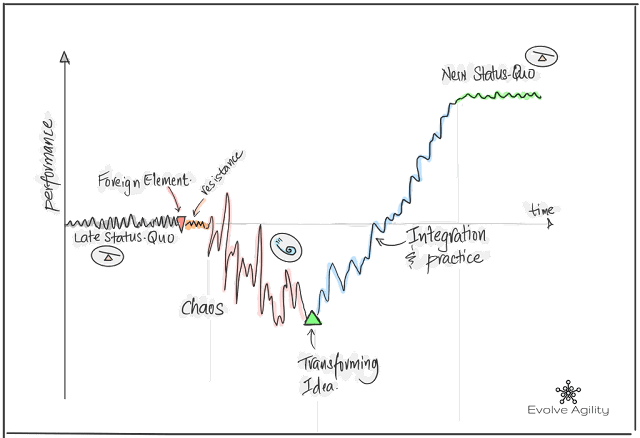 Organizations in late status quo is a balancing system (systems thinking archetype), where different parts of the system pay different prices to maintain balance. The organization system has stayed the same for a long time. Actors in organizational system know ‘what to do’, ‘how to do, understand where they fit, and know what they can get away with. These ‘games’ or dysfunctions are part of the routine for actors these are indistinguishable from real work. Individuals working long hours compensate by not exercising or spending less time on family matters. “This is very important TPS report, I will take my evening walk tomorrow”. Teams support low-performing members by everyone else doing a bit extra or tolerating dysfunctional behavior and nobody says anything about it. Organizations ask for thorough cost-benefit analysis or business case to justify change initiative. Instead of assessing where we are at and where we need to be, organizations ask for proven case-studies and success stories before they consider changing. Systems favor self-preservation, this survival instinct is necessary condition for systems to continue to exist. Something happens that people in the system can no longer deny – this foreign element is generated internal or external or just plain old randomness. Ignoring, or ejecting, or neutralizing impact of alien elements are systems’ defense mechanisms. Actors in the system try to accommodate using delaying tactics, or try to encapsulate foreign element within the “normal” way of handling things, or may find somebody to blame. After reading newspaper article on impact of stress, a workaholic blames their partner for not supporting their career goals. After attending an agile conference, team-members acknowledge importance of cross-functional work and demand full management support before they are willing to try pair programming. Organizational leadership takes note of stealth agile implementations and appreciates their success. As a result, mandates organizational agile transformation by a fixed future date. Organizations in late status quo are closer to breaking point. Actors who are compensating and sustaining late status quo find their situation is no longer tenable. Systems in late status quo can learn to deny, ignore, or accommodate foreign elements developing unhealthy dysfunctional behaviors for a long time. Just waiting out organizational change initiative is a veteran tactic to diffuse energy and support in organization systems. It is not possible to predict, but one of these many foreign elements knocks late status quo systems off balance. This could be increasing attrition rate of customers/employees or difficulty getting new ones, or perhaps a sudden change in technological landscape that threatens organizational survival. With critical mass around the foreign element, internal or external, late status quo system tips or gets knocked off balance. This is disorienting. The experience is similar to children’s game of being spun around while blind-folded. Usual ways of getting things done are challenged and there is confusion about ‘what to do’ and ‘how to do’. People react in a number of different ways: by engaging in random behavior, by seeking stability at any cost, or trying to revert to earlier patterns of behavior. It is common for people to seek for silver-bullet solutions, or seek for complete description of end state, to pursue order in midst of chaos. The uncertainty inherent in chaos zone is unsettling. Even when people realize that old status quo is not where we need to be, they seek the familiarity of old status quo. Loss aversion – losses loom larger than gains, tendencies kick-in. Faced with intervention from their child, who is upset at not seeing parents at his favorite school play may tip a family into reevaluating their work life balance priorities or hire a very expensive nanny. Teams attempting scrum, may discard it and switch to kanban or vice-versa. They may continue to chase the next big agile thing like devOps or server-less in endless pursuit of a quick silver bullet. They may end up blaming organizational culture and continue to operate worse than before. At the all hands meet (AMA), CEO’s declaration of Agile transformation initiative to be completed by end of fiscal year was received with muted murmurs and extended break room conversations that impacted overall effectiveness. Many managers reported to executive committee that Agile is not working and we should revert to the way things were before. People change, people change all the time. People buy houses, get married, have children, relocate and can cope with the changes all the time. They resist being changed or coerced into it. Everyone cannot be skilled at coping with chaos in all realms of their life. Organizations often attempt to direct change in behavior and expect that results will follow. This almost never works, because the experience of people trying new approaches is negative they do not alter their core belief systems. At its best, leaders get compliance or in worse cases rebellion. Leaders skilled at surfing chaos set clear guardrails and focus on developing compelling experiences that lead to transforming ideas. Leaders recognize that transformation must first start from within. So they create an environment where good ideas can get recognized and implemented. They focus their energies of creating a context for learning and recognize that many good ideas will have to be discarded before a transformational idea is recognized and tried. Parents decide to set clear boundaries at their work place so their colleagues are respectful of their family time. This helps them to find time for physical exercise, and taking care of their family. Team members recognize that they have been too insular and decide to get help from ‘coaches’ (internal or external). After six months into Agile initiative, executive committee convenes an off-site where under guidance from expert facilitator they are able to discuss real issues, build upon each other’s ideas and agree to run focused controlled change ‘experiments’ instead of asking people to fall into line with the ‘big-picture’ Agile scaling framework. During integration stage, there is excitement, energy and things seem to be improving. The feeling is so good that people mistake that this is the change. But the journey has only now began. This is a phase where leadership has most influence and gets tested all the time. There is strong temptation to declare “mission accomplished”, collect laurels and march on to the next big thing. This rush of excitement energizes people to try out other new ideas, many of which do not work out. So the system, is thrown back into chaos. Many organizational systems are stuck oscillating between chaos and integration, never fully realizing full benefits. Desire for quick fixes and leaders aspiration to make their mark, forces regime changes that desensitize employees to management. It is fairly common for veteran’s to list all the management thinking changes from Lean and TQM movement, to Agile and DevOps that have come and gone while never delivering on promised benefits. With new found family time, they impulsively adopt a puppy. Excitement around new member in the family is mixed with feeling of anxiety around lack of attention to work and growing needs of family dog. Team members identify many new ideas in initial sprint retrospectives and after a few sprints find that most of the actions items from previous retrospectives are repeating themselves. They are struggling to find time to implement most of their action items in light of higher delivery expectations (now that they are agile). They think retrospectives are a waste of time. While the energy and excitement within organization is palpable, the executive committee is not seeing improvement in its traditional productivity measures. So they decide to intervene by asking for company wide rollout of Agile life cycle management tool. This will help them to get accurate data, because clearly this much fun (and engagement) is not justifiable if we are not able to quantify. During integration and practice, people are learning to use new practices and tools. Appropriate training, coaching, support, and most importantly space to integrate new practices into people’s way of working is needed. Do not rush to quantify benefits, metrics have their own tendencies to look good even when the actual performance may be nose-diving. Integration of new ways of working results from many tiny changes to the system at work. These cannot be rushed. With sufficient information, support, and structure the actors within a system arrive at new status quo. There is now familiarity with new way of working, people are at ease and relaxed. A new vocabulary, mental models and belief systems emerge. “How we do things around here” – the culture that emerges from the dip, through chaos and integration, stabilizes to become the new norm. The organization is no longer viewed as the obstacle. And the cycle continues. 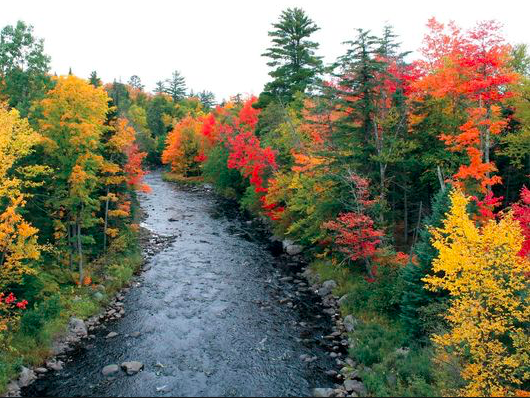 Change is inevitable, it is happening whether we like it or not. Organizational anti-bodies that attack all foreign elements, need to be developed to pick out beneficial foreign elements from the harmful. A leaders role in learning organization is not ordained, it is earned. From their organizational position and from resources they posses a leader adapts themselves and influences the climate around them so that people become empowered to change themselves and the environment around them. The only business of being a leader is to create other leaders. If you haven't been following the earlier blogposts before, you can read it all here. 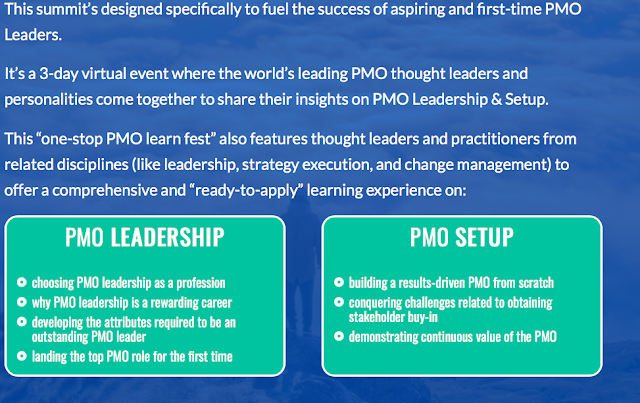 Before you read, the PMO Virtual Summit has opened up for Registration. And its FREE. Learn from the global thought leaders over 3 days from the comfort of your couch. The speaker list can be found here. This is being organised by Toronto based Parwaz Consulting Group. If you are getting started for this week, so am I with some great news about the PMO Virtual Summit that I talked about last week. Did you get a chance to download the free ebook? If not, you can still click here. 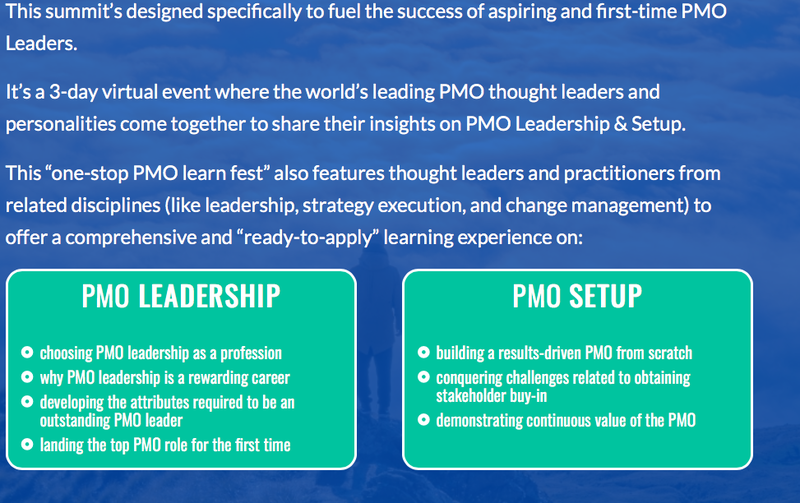 So, PMO Virtual Summit is a three day virtual event (yep, no travelling involved), where the world global thought leaders on PMO will be speaking. The dates are October 16 to 18. If you are looking for the list of speakers, wait no further, click right here. Registrations are not open yet, watch the space. However, you can still get something today, a template bundle for you. 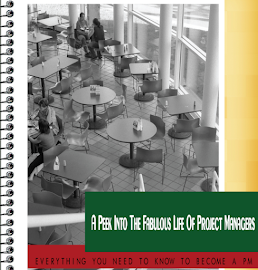 It has everything you need to help you get started in setting up your own PMO office. Registration haven’t opened yet, but you can access the discounted price of $97 for the All Access Pass which allows you lifetime on demand access. 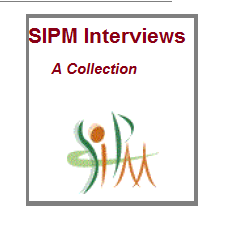 This is best for those learners who want to learn form the industries best and hear it over and over again, or group of friends who are joining the PMO soon or already are part of it. If you have happen to have a team or lead the PMO- what better way to get your educated under less than $100. So, if you are still up for lifetime of learning, grab your passes before the prices go up. The registrations open up on October 11. Hello there, hows the weekend going. If you are looking for some weekend read, heres one published in Knowledgehut: Agile Adoption- Should it be data centric? Want to bring some sparkle back in your life and you think you never take the leap, watch the video below thats why you are probably scared and thats okay. Here are ways to you can fight it back. Hope you enjoy! If you haven't still looked at the last post and got your ebook copy, here it is one more time. So, lets just say this Fall is starting with some exciting news. In collab with Toronto based Parwaaz Consulting Corporation, we are bringing you some great stuff meant for anyone interested in PMO or entrepreneurs working towards your scaling business goals. So, lets say you’re a project manager, portfolio manager, or an operational manager that’s had an amazing opportunity fall in your lap. You might be thrilled to have the opportunity to head up a PMO in your company. 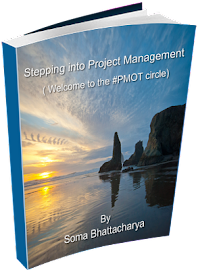 Its said that 60% of PMO managers have had someone question their value in the company and 50% of project management offices are shut down within three years. Hussain Bandukwala of Parwaaz Consulting Corporation; has run Project Management Offices responsible for multiple eight figure projects He hasn’t just done it, he’s taught it, and helped establish them for small and mid-sized organizations. And in doing that, he’s seen the best and the worst of the PMO world and made some amazing contacts. So now, he’s is giving way the knowledge that took him years to get all for free. 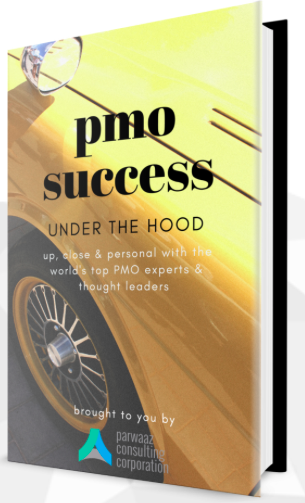 Take a look at PMO Success: Under The Hood - a free e-book that has over 20 Project Management Office experts, collaborating to give the strongest possible start to anyone interested in being part of PMO. There’s no PMO tool at your organization (or the current one is really bad). Which tool would you get? 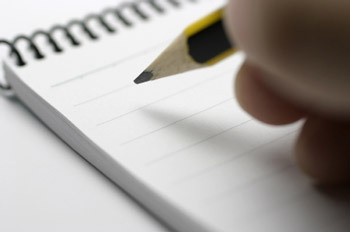 He is also coming up with the PMO Virtual Summit (details coming soon) that brings in experts from all over the world. Information about All Access Pass and tickets coming up.